Prepare to take a ride on an emotional roller-coaster across the most challenging aspects of Russian language. Or should I rather correct the previous sentence, “descent into madness”. Some of my French and Luxembourgian friends married some of my Russian friends and are currently learning Russian in order to improve communication with their spouses and show devotion. Naïve martyrs, says me; little do they know that the system of conjugation and declension has so many illogicalities and exceptions that it is easier to say that there is absolutely no system to declension and conjugation. Let’s begin, shall we? In Russian, if one is narrating a story and wants to emphasise the suddenness of some action, one can substitute the 3rd person past indicative (singular or plural) with the 2nd person present imperative (singular only). This works in reverse: one can use 2nd person past perfective to denote imperative! In fact, when narrating, instead of 1st person past continuous, one can use just present (Russian does not have continuous tenses, neither it has present perfective.) However, incidentally, the present tense can also describe future events. Шагаю я намедни по плацу, а у меня возьми и отойди пуговица на шинели. Старшина тут же: «Быстро пришил пуговицу обратно!» А я не могу, я встречаюсь с девушкой через час. Verbatim translation: I am marching the other day on the drill ground, and suddenly, you, button, imperativego and imperativefly off. Sergeant: “You sewed this button back on!” But I cannot waste time, I have a date in one hour! Proper translation: I was marching the other day on the drill ground, and suddenly, a button decided to fly off. Sergeant: “Hey you, imperativesew this button back on!” But I cannot waste time, I am having a date in one hour! You know, in some languages, verbs have their own conjugation tables. Enormous tables for every single verb. Like conjugaison.com (from the creators of “j’aurais voulu que vous sussiez” and “vous pûtes”). Some verbs do not necessarily make sense in certain forms (no one would say about themselves “I foal”, which means, to give birth to a colt—a baby horse). Russian has a verb for giving birth to a horse (жеребиться), but does not have its first-person form (жереблюсь? жеребюсь? ожеребляюсь?). Another example is the modification of “to head up” for a wheat spike. If anyone here is a wheat spike, raise your awns. Some verbs do not have certain forms because they would just sound awful (бдеть, to keep vigil — бжу? бдю? бдею? ; шерстить, to irritate someone’s skin with wool — шерщю? шерстю? шерщиваю?). So in Russian, those verb forms are substituted with ersatz expressions (сохраняю бдительность, я свитер, оттого я чешу и колюсь). Those are called insufficient verbs since they do not have certain forms. Do not be surprised if you cannot simply translate “I shall win” using the future perfective form of the verb “to win” because there is none (variants such as победю, побежу, побежду are all wrong)! You already lost when you started learning Russian. Conversely, some verbs have two forms (such verbs are called superfluous). Of course, with slightly different meanings; otherwise, where would be fun in that? For example, the verb “cast” would have the same infinitive but different indicative forms: “Zeus casts lightning bolts” (Зевс мечет молнии) and “the athlete throws the hammer” (спортсмен метает молот). Говорить — говаривал, петь — певал, сидеть — сиживал, есть — едал, ездать — езживал, гостить — гащивал, обедать — обедывал, драть — дирал, двигать — двигивал, махать — махивал, жить — живывал, гонять — ганивал, спать — сып́ал, кутить — кучивал, бегать — бегивал. Also, one cannot just say, “there is a glass on the table”. Things on top of other things must either stand, lie, or sit, and there is no rule, logic or mnemonic to determine which verb to use. There is a table. There is a glass on the table. It is standing (стакан стоит). There is a fork on the table. It is lying (вилка лежит). However, if we stick the fork into the table, it will be standing (or sticking out; будучи воткнутой в стол, вилка стоит вертикально). Maybe it is the horizontal / vertical orientation that matters? Let’s add a plate and a pan. 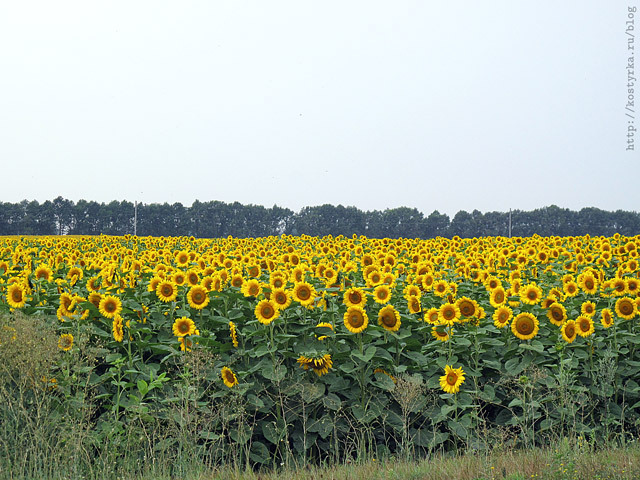 They are horizontally oriented, but they are still standing (на столе стоят тарелка и сковородка). Now let’s place the plate inside the pan. Now it is lying in the pan (but it had been standing on the table; тарелка лежит в сковородке). The readiness of an object for use is not an indicator: the fork is lying. Not a cat jumps on the table. The cat can stand, sit or lie (кошка стоит, сидит или лежит). It is trivial to connect lying / standing with the cat’s orientation, but sitting? It is a new property. The cat’s bottom is instrumental in sitting (кошка сидит). Now a bird lands on the table. It is sitting as well (птица сидит). However, its legs are fully supporting its body, and in no way the bird is using its botty department. The bird, however, is never standing. Now we go berserk, kill the bird, and a taxidermist (probably Chuck Testa) stuffs it and makes a completely life-like bird—and now it is standing (чучело птицы стоит)! If you think that only animate object can sit, you are wrong again: a shoe sits on a foot, a dress sits on a person, a car sits in snow, a mosquito sits in amber (ботинок сидит на ноге, платье сидит на человеке, машина сидит в сугробе, комар сидит в янтаре). These objects are inanimate, do not have buttocks, but still, they are sitting! Now go figure out which objects sit, which stand, and which lie. The Staffordshire department of the Royal Society of Putting Things on Top of Other Things must have accepted too many Russian members! One cow, two ofcow, three ofcow, four ofcow, five cows, six cows... eleven cows, fourteen cows, and so it goes on until twenty cows. Then... you have twenty-one cow. Because it ends with one! Then, twenty-two... you guessed right... ofcow! Twenty-four ofcow, twenty-five cows, and so it goes on. Everyone remembers Disney’s “101 dalmatian”, right? A small but nasty one: while the words for 20, 30, 50, 60, 70, 80 and 90 are based on 2, 3, 5, 6, 7, 8 and 9 respectively (like two-ten, three-ten etc. ), the word for 40 (сорок) does not have anything related to four. Instead, it is related to.... packed bundles of sable fur, why not! 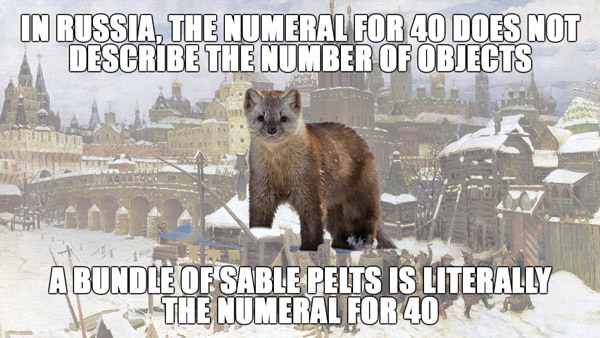 It is not the word forty that Russians used to describe the number of sable pelts in a bundle sufficient to make one coat; it is literally the word “cloth to wrap a bundle of sable pelts” that Russians use for forty! The closest relative of this atrocity is the word сорочка (a shirt made of cloth), which is widely used as a synonym for рубашка. Bulgarians did not have sables or martens, so in Bulgarian language (which is re-e-eally close to Russian), they use Russian numerals two-ten, three-ten, four-ten, five-ten etc. No animals harmed. Я гордый владелец трёх тысяч пятисот семидесяти четырёх коров. Я гордый владелец трёх тысяч трёхсот тридцати четырёх коров. Я гордый владелец трёх тысяч семисот четырнадцати коров. I am a proud owner ofthree ofthousand offiveofhundred ofsevenoften offour ofcows. But! I am a proud owner ofthree ofthousand ofthreeofhundred threeoften ofthree ofcows. But! I am a proud owner ofthree ofthousand ofsevenofhundred fourofteen ofcows. Oh, and did I tell you that you have four more cases to remember for these numerals? To make things worse, numerals ending with 1 or 2 can have genders in the nominative case. But only masculine or feminine. No neuter. Два чайника, две чашки, два пальто. Speaking of genders, verbs have genders in the past, but not in the present or future. Металл кипел, сталь кипела, железо кипело, жидкости кипели. Russian has different declension rules for animate and inanimate objects. However, a stiff is animate, while a corpse is not. Why? Well, only a human being can be a stiff, but corpses can also be of animal origins... so it makes dead animals less animate than dead humans? I hypothesise that this dates back to Russian folk tales in which stiffs came to life after being sprinkled with the Water of Life™ (they also featured the Water of Death™ that was used to join together the pieces of a fallen hero). However, the more logical reasoning is the following: the word мертвец (stiff) has a tinge of “freshness” (just died), maybe clinical death, someone who had just died, but the word труп (corpse) denotes something that has been dead for a while. One does not exhumate stiffs; only corpses. In official language (forensic reports) one might use the collocation свежий труп (fresh corpse) to indicate that the body has not begun to rot yet. You thought it was over, huh? Cue fractional numerals! You all know that 8 metres should always be “eight metres”, no silly gobbledegook like “three ofcow”? Well... if it is 8.6 metres, it has to be spelt “eight and six tenths... ofmetre”, because it is the bloody tenths that govern the declension “of metre”! However, if one means “8½ metres”, it becomes “eight and a half metres”. Did I say that while “my pie” is singular, “my half a pie” is plural? Like “ton gâteau” but “tes demi-gâteaux”! Speaking of numerals. Most languages have cardinal numerals and ordinal numerals. However, Russian also has collective animate masculine numerals that sometimes describe groups of men, occupations (but possibly females), and uncountable singular nouns! One can’t say “two ofman”. One must say “two-group men”. Then, “three-group men”, up to “nine-group men”, although one can use the simple cardinal plural starting from 5. And one must not use collective numerals for groups larger than 10. 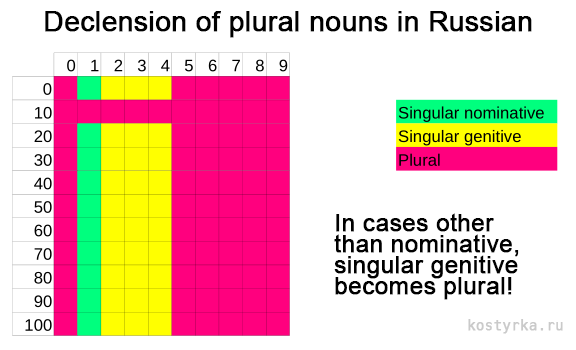 And some countable nouns have absolutely mental plural forms: дно — донья (bottom; almost like doña), брелок — брелоки (keychain, but чулок — чулки, stocking), шило — шилья (awl), профессор — профессора (professor). It gets better with genitive: кочерга — кочерёг (hot poker), кровля — кровель (roofing), усадьба — усадеб (manor), вафля — вафель (waffle), цапля — цапель (heron), кегля — кегель (bowling pin), but кегль — кеглей (typographic unit, from German Kegel). If the numeral ends with 1, 2, 3 or 4, one uses singular declension rules to denote multiplicity. However, in cases other than nominative, one uses plural for those one ending with 2, 3 or 4. If one thinks of those objects as of a large group performing an action, instead of the plural form of the verb, one can use the neuter singular! However, if the numeral ends with 1, one must use the singular form of the verb of the appropriate gender! Сто один далматинец переходил дорогу. Грузовик сбил сто одного далматинца. Сто два далматинца переходило / переходили дорогу. Грузовик сбил сто двух далматинцев. Сто пять далматинцев переходило / переходили дорогу. Грузовик сбил сто пять / пятерых далматинцев. One hundred and one dalmatian was crossing the highway. The lorry ran over hundred and denone dendalmatian. One hundred and two ofdalmatian was/were crossing the highway. The lorry ran over denhundred and dentwo dendalmatians. One hundred and five dalmatians was/were crossing the highway. The lorry ran over denhundred and denfive / denfive-group dendalmatians. I have no words. The only thing I have is an back-of-the-envelope estimate: if kids start learning Russian at the age of 0 and by the age of 18, having graduated from high school, are aware of all these pitfalls, then it would take 18 years of intense learning (like at school, multiple hours per day of reading textbooks in Russian, watching TV, communicating with native speakers etc.) to master Russian. If you are a non-Russian reading this, the only way to comprehend Russian grammar is marrying a Russian and learning the language with your kid. By the time they reach the age of majority, you will be able to speak as fluently as they. Из-под сена виднелись: самовар, кадка с мороженной формой и еще кой-какие привлекательные узелки и коробочки. Во-первых, я очень хочу посмотреть в рукопись Льва Толстаго. Но это не выход, так как даже Достоевский, городивший откровенную пунктуационную чушь, яро защищал своё видение знаков препинания в собственных произведениях и продолжал лепить запятые(,) как его душе угодно. Если наборщики меняли ѣ на е, но не меняли е на ё, то логично предположить, что чужеродные демоны копошатся и в вышеприведённой цитате. Во-вторых, отсутствие дефиса в слове «какой либо» (абзац напрямую скопирован из правил без единого изменения; ошибочное написание выделено тёмно-красным) говорит о том, что серьёзно к данному правилу относиться не следует. На сегодняшний день правилами может допускаться какое угодное написание, однако благородные люди никогда не станут употреблять допустимую или разговорную норму вместо книжной; наоборот, они будут иногда приукрашать речь устаревшей нормой. Аристократы и истинные ревнители знания будут по-прежнему говорить «фо́льга», «чёрный кофий», «будьте до́бры», «покушать молока»; они никогда не станут перегружать письмо пунктуационными окказионализмами или разбивать предложения с однородными членами без обобщающего слова нелепым двоеточием. При перечислении однородных членов предложения без обобщающего слова двоеточие ставить нельзя, это ошибка, даже если однородные члены для наглядности оформлены в виде списка. Мы предлагаем клиентам моторы, оптоволокно, картины из хрусталя, профили, светильники. Мы предлагаем клиентам: моторы, оптоволокно, картины из хрусталя, профили, светильники. Нехватка иль гемоглобина, иль железа. Подсказка: эту шараду надо загадывать вслух. Зная английский, купили бы «Вискас»? Все мы знаем, что «Whiskas» (до 1988 г. — «Kal Kan», что, согласитесь, не очень благозвучно) — это один из крупнейших производителей кошачьих кормов. Ещё мы знаем, что английский язык настолько компактный, что двухсложные слова-омонимы могут иметь более пяти вариантов написания, не говоря об односложных. Ранее мне было приятно сравнивать себя с котами, с их мягкостью, тёплостью, пушистостью, да и общаться с чужими котами приходилось часто. 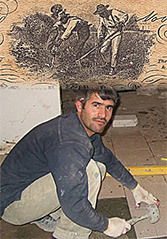 Даже собственные бакенбарды (англ. whiskers) напоминали об этой незримой связи с фелициями, наделёнными вибриссами и бородой по всей голове. Однако недавно были обнаружены ещё два слова, звучащие как «вискас» по-английски. сущ. длинные, жёсткие, тактильные волоски или щетинки, растущие вокруг рта или на других частях головы у большинства млекапитающих. сущ. один из органов, расположенных в полостях тела животного; часто под В. подразумевается содержимое брюшной полости. прил. липкий, клейкий, испытывающий большое сопротивление при перетекании, тягучий, густой по консистенции. 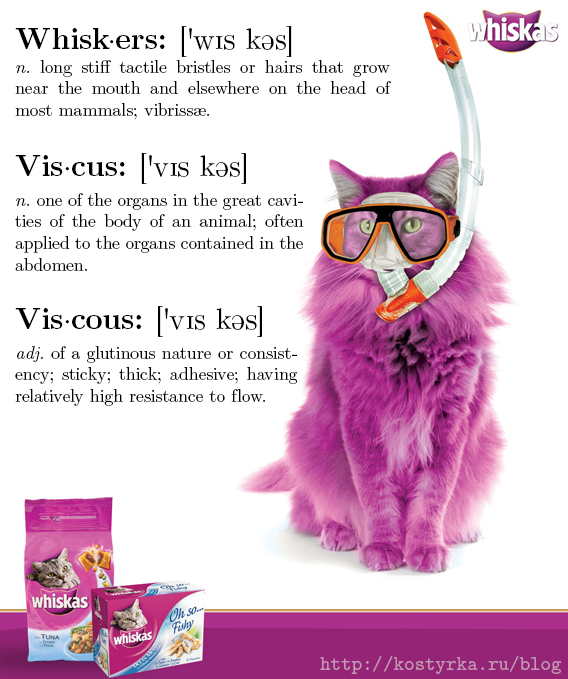 Что самое интересное, «Whiskas» — это удивительно точное название для корма: для обладателей вибрисс, состоящий из потрохов (мясокостную муку и требуху в составе сухих и влажных кормов никто не отменял), а также вязкий по консистенции (касается сочных кормов в пакетиках). Vive la langue anglaise! «Монти Пайтоны» исполняют восхитительный скетч с шарадами, пользуясь компактностью английского. Miss Steaks I can Nazi. Качество детериорировало-детериорировало да и выдетериорировало. Лингвисты очень любят поссориться по поводу того, считать ли украинский язык «испорченным диалектом русского» или нет. Ещё Даль писал: «Возьми у нас в былое время Новгород, Псков или Суздаль перевес над Москвою, и нынешний московский язык слыл бы местным наречием. Поэтому не было бы повода почитать московское наречие более чистым и правильным, чем мало- или белорусское, если бы это наречие не обратилось бы в язык правительства, письменности и просвещения» (а первой ласточкой в этой области была мысль Михайло Ломоносова). И было бы весьма эпатажным занять какую-то одну сторону в споре и начать дискуссию с пеною у рта. Лингвисты ведь очень любят разложить карты, повесить тузов на погоны, начертить каких-то границ распространения говоров и свою весьма абстрактную и спорную теорию пытаться как-то формализовать с опорой якобы на числовые и пространственные данные. При этом карты у них не совпадают, начинается полуштриховка областей, лингвисты бранятся, и вот они уже не приглашают друг друга на свадьбу, а только на похороны. Как бы это ни смешно звучало, в данном споре даже «примирительную» среднюю позицию занять трудно. Сказать «и да, и нет» — это не сказать ничего касательно малороссийского языка. Це якось негарно. Но как было бы здорово, если бы исчез этот придурочный придуманный водораздел между русским и украинским! Якби лінгвісти попалили к бісу ці дурні карти! Я искренне полагаю, что малороссийские говоры обогатили бы художественную русскую речь, привнесли бы в неё ещё больше нюансов, усложнили бы организацию языка. Подумать только: сколько рифм бы пришло вместо избитых и раздражающих «тайно — случайно» и «любовь — кровь — вновь». Появилось бы просторечное «негайно». Начали бы «когда любов, разрушил бы тысячи будо́в». Естественно, истинные поэты отыскали бы куда более изящные совпадения, которые бы меньше пахли салом сельской местностью. «Вдохну я в грудь аэрозолю \\ И моментально сбожеволю». Некоторые грамматические формы, безусловно, должны оставаться «приписанными» к своим областям. Однако некоторые тонкости, наоборот, приукрасят речь. Так, даже галлицизм «я поправил свой бель крават» станет понятным говорящему на обогащённом языке, так как «кроватка» в украинском — это галстук. «Меня пленил вершковый кофий» — насколько это возвышеннее, чем какой-то «кофий со сливками»! Сливки — это как будто кто-то что слил; опивки, не иначе! Господарь (в значении «хозяин») суворо (строго) окинул меня взглядом, и мне сразу стало жутко, будто бы в меня без шубы на улице вцепился лютый (февраль). И уж как прозрачна бы стала шутка «Гений без буквы „е“»! Посыпались бы лозунги против пиянства, содержащие рифму «зелёный змий — гний» (последнее слово — в значении «навоз», а не повелительное наклонение от «гнить»). Я искренне надеюсь на то, что наиболее возвышенные украинские слова, менее всего похожие на малоприметный диалект, войдут в русский язык и станут литературной нормой. Я искренне надеюсь, что использование переводчика при диалоге русского и украинца будет караться, как разжигание межнациональной розни. Я хочу, чтобы словарный запас жителей обоих государств стал общим, а оба лагеря лингвистов и язычников признали свою неправоту и раскаялись в экстремизме. Вашему вниманию предлагается загадка, решающаяся в одно действие, но требующая нескольких нетривиальных логических умозаключений. Если бы можно было разрезать книги и выпотрошить на весы их содержимое, то моя сатира граммов на пятьсот перевешивала бы вашу. Браво, новеллист! Браво! Писомые в наше время пиэски и рядом с вашими опусами не стояли! Ленту натянули получше, и налаженный конвейер дна жёлоба уже не царапал. Ивашка, желая выделиться на маскараде, напялил настолько громадный кафтан, что у него растянулся на плечи ворот; кивер же ему вообще доходил до середины носа, и оттого через пять секунд глупый мальчишка, не видевший даже своих ног, поскользнулся на подоле. В полулитровых банках закрыты консервы, а в трёхлитровых закрыт сок. Уважаемая Маргарита, прошу Вас решить данную загадку. Эти подсказки составлены мною персонально для Вас; для других адресатов я буду вынужден изменить парочку подсказок. Можете считать это ещё одной подсказкой. Помогите Маргарите Осиповой решить данную загадку. Для затрудняющихся читателей я подготовил несколько наводящих подсказок. При нажатии на выпадающую кнопку будет открываться следующая подсказка, всё ближе подводящая к правильному ходу мыслей. Подсказка 5. Во всех пяти подсказках информация для примера зашифрована одним и тем же методом. Она не нужна для решения задачи; отгадывающий должен, опираясь на эти пять примеров, установить метод шифровки. Фамилия Николая расшифровывается им же. Подсказка 4. Фамилия Николая начинается с буквы М.
Подсказка 3. Фрагмент о Николае состоит из пяти строк. И подсказок в письме тоже пять. Подсказка 2. Курсивное/прямое начертание играет роль. Подсказка 1. Всё письмо является загадкой. Полезная информация начинается со слова «Кому» и заканчивается на словах «Жду ответа». Почему-то ни в словарях диалектизмов, ни в интернете нет толкования слов «кильчиба» и «негебурный» (малоросс.). Надо исправить эту ошибку. Кильчиба — образное выражение для описания некоей горькой субстанции, пробуемой на вкус. Кильчиба — что-то горькое, противное, похожее по вкусу на полынь. Кильчибой также может называться недейственное лекарство. Ты мне в чашку положил три ложки кофея, да ещё и с горкой? Кильчиба страшная, пить невозможно! Мне в поликлинике доктор на горло пшикнул какой-то кильчибой, а мне лучше не стало, только от горечи избавиться два часа не мог. Негебурный — некрасивый, нечупарный, сделанный неаккуратно, грубый. Смотри, вокруг частных домов оградки стоят аккуратненькие, а вокруг кладбища забор какой-то негебурный. Вот же ты мне ножик починил! Мало того что лезвие затупил, так ещё и негебурную сучковатую ручку приделал — я руку уже натёр. Прораб — сокращение от профессиональный раб. ¹ Derp is an expression associated with stupidity, much like the earlier forms of interjections like “duh” and “dur”. In Internet slang it may be used as a placeholder expression (dialog may be expressed as “derp derp derp”). A character named Herp Derp is meant to represent stupidity or ignorance. Ладно, это не юмор, а бульварное юмло (юмор при промахивании на одну кнопку клавиатуры). Далее приведу пример, который пришёл ко мне в голову в 14 лет. Как перевести имя Richard в сказке, в которой оно дано флегматичному герою, трусливому королю, который живёт в праздности? Следите за цепочкой. Имя Ричард обычно ассоциируется с якобы отважным и доблестным Ричардом I Львиное Сердце, поэтому данная аналогия вполне уместна. Молодец, Андрей Викторович, если бы и сейчас Вы мыслили столь же изобретательно, сколь и о четырнадцати зим. Откройте Microsoft Word, Блокнот или любой другой текстовый редактор. Выберите шрифт Times New Roman и сделайте крупный размер (например, 72). Переключитесь на английскую раскладку и наберите заглавную букву K (как в слове Kettle). Переключитесь на русскую раскладку и наберите заглавную букву К (как в слове Кость). Мне представляется совершенно нелогичной сложившаяся в русском языке обстановка. Некоторые положения противоречат моим светлым и безмятежным представлениям о словесности. Пока мне удалось вспомнить лишь одно-единственное. Почему-то в словосочетаниях со значением «сделать что-то благодаря чему-то / с помощью чего-то» возникает слово «счёт». Как будто кто-то с кем-то сводит счёты или обналичивает чужие банковские счета. «Она победила на конкурсе красоты за счёт своей наследственности». — Прошу прощения, откуда у наследственности может взяться счёт? Как это благодаря эксплуатации активов наследственности можно выиграть конкурс красоты? Сравните данные грамматически безупречные предложения. В далёком детстве он любил бегать по квартире с машинкой на верёвочке; однажды он зацепился ею за тумбочку со стоявшей на ней керамической фигуркой китаянки и опрокинул её, о чём впоследствии не один год непритворно сожалел. Мало того что вся кожа покрылась болезненными красноватыми волдырями, так ещё и начала безо всякой причины ныть спина; конечно, окружающие солдаты были людьми понимающими и из сердоболия отдавали причитающийся им кусок сахара пострадавшему, однако в последствии химической атаки не было совершенно ничего, за что больной мог пожелать испытать такое же потрясение кому-нибудь другому, пусть даже и самому ненавистному врагу. В данном примере показано, что слова в последствии и впоследствии в зависимости от контекста должны писаться то слитно, то раздельно. Более того, в иных правилах русского языка предписывается писать слитно там, где можно заменить подходящим по смыслу синонимом: нелегко → трудно, небитый → целенький, впоследствии → позже, вследствие → из-за и т. д. Я вижу дальнейшее употребление предлога за счёт в раздельном написании неразумным в том контексте, в котором их можно заменить предлогом благодаря. Давным-давно, когда мне не было и восемнадцати лет, в моей голове стройно сложился весь свод правил русского языка. Он давил своим корпусом и заставлял меня писать за счёт слитно. И я писал. Писал, пока не обратил внимание на то, что спеллчекер подчёркивает этот неологизм красным. Это заставило меня прекратить выставлять данную проблему напоказ и начать серьёзно обдумывать обоснование столь дерзкой уверенности в справедливости слитного написания. Надеюсь, что академики сочтут мою аргументацию достаточной для того, чтобы понять и пг'остить допустить в моём родном языке подобное правило, устраняющее меркантилистский, математический и ресторанный счёт из предложений, где он не подразумевался. P.S. Мне сообщили, что господа с вопросами №№ 249951, 244371, 207008, 200995, 242233 и проч. на сайте gramota.ru также задавали вопрос о предлоге за счёт. Значит, не одного меня глодал червь сумненья, значит, есть какой-то общий разум в головах! Он заходил всё дальше и дальше в лес и шёл вглубь. Он заходил всё дальше и дальше в глубь леса. По смыслу эти предложения не отличаются ни на йоту, хоть убей. Однако во втором предложении откуда-то возникает эта загадочная глубь, глубина, и в эту глубину, значится, кто-то заходит. Но я захожу не в глубину, а в лес! Лес представляет собой бескрайнюю даль, а не глубь, поэтому я иду дальше, а не глубже. Пускай бы себе был такой предлог «вглубь», который бы при управлении существительным ставил оное в родительный падеж (я не желаю говорить «управлял родительным падежом», так как это некорректно: управляют существительным, а результат управления — нужный падеж; управляют человеком, а результат — изделие, им произведённое; нельзя управлять изделием). Я полагаю, сознательным русскоговорящим его очень не хватает. В русском языке нет слова «ступня». Употреблять его может только самая распоследняя тупня. Правильно: стопа.